Disinformation? What Does Fidel Castro Really Think About Cuba's Economy? Upon receiving a phone-call from Fidel Castro's office in Cuba inviting him to interview the Cuban dictator, Jeffrey Goldberg, a journalist for The Atlantic got in touch with his Institute for Policy Studies friend Julia Sweig, who is currently working for the Council on Foreign Relations. Together they travelled to Havana, Cuba for the interview with the First Secretary of the Communist Party of Cuba. The duo met with Castro on and off over a period of three days (August 29 - 31). 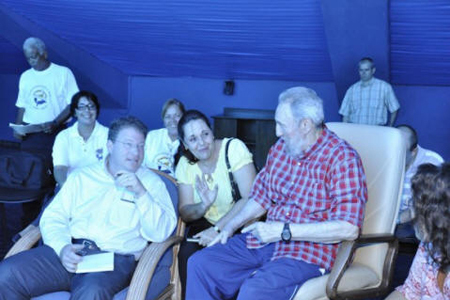 During their first meeting, Goldberg asked Castro if he believed the Cuban model was still something worth exporting. Castro replied, "The Cuban model doesn't even work for us anymore". "He wasn't rejecting the ideas of the Revolution. I took it to be an acknowledgment that under 'the Cuban model' the state has much too big a role in the economic life of the country." Cuba's leading institutions of governance have set the stage for a number of important systemic changes toward a market-oriented economy, Sweig explained. New proposals include private ownership of land, the shift from collective farming to cooperative farming with private ownership rights, the licensing of the 250,000 to 500,000 small businesses with non-family employees (as long as social security taxes are paid), and introduction of limited foreign investments in real estate. Just this week, the Cuban government announced a plan to shift 500,000 government workers into the private sector in order to cut unsustainable budget expenditures. Sweig said Cuba's internal changes and other global realities show that U.S. attempts at economic isolation of Cuba have failed and are unnecessary. The embargo is not a foreign policy; it is a domestic policy aimed at nothing more than addressing "a perception of the Cuban American vote" in Florida, she said. "I think it's time for the United States to recognize that 50 years of one policy haven't achieved the intention which was to block the revolution, stop them from exporting it, and overthrow etc.," she noted. "I think it is time to take 'yes' for an answer." Many US anti communists have seized on Castro's remarks as a a sign that communism is finally on the way out in Cuba. That even a fanatical communist and mass murderer like Fidel Castro can see the error of his ways. Yes and I own a large statue in New York Harbor I'd like to sell you. Castro's statement is pure disinformation - channelled through Cuba's allies in the Institute for Policy Studies, Council on Foreign Relations and the Communist Party USA. Castro knows that Obama Administrations wants to drop US trade and travel restrictions regarding Cuba - a long time goal of the Castro regime. Castro knows he has to throw Obama a bone. If Castro can create the impression that Cuban communism is crumbling, conservative opposition to easing sanctions on Cuba will be neutralized. Communists have used this ploy countless times from the time of Lenin's New Economic Policy in the 1920s, right up to the present day. Castro knows that a few well chosen words to some sympathetic journalists could reap huge rewards in strategic terms. A simple rule of thumb when evaluating communist propaganda: when communists beat the war drums and pose aggressively, they are usually weak. When communists tell the world they are weak and their system is faltering, they have a major prize in their sights. Got to hand it to the bolsheviks, they know how to stick to a gameplan, no matter how flawed. The castros love capitalism, ask their swiss bank accts., 300 million in good ole Yankee dollars at last count. Their agenda calls for a "permanent" revolution which mmeans a continuing "State of Emergency" which invokes the "Law of Necessity" which suspends a Constitution and all rights and establishes martial law. Communism IS a permanent martial law society, a police state dictatorship. That's what exists in Cuba. Castro's decress are what the "law" is. Anyone who disagrees disappears forever.